1993 we started exploring different fibers. We tried Angora rabbits and an Angora goat and then moved into the sheep world with Cheviot and Merino sheep. The wool and angora was handspun by Norma and used in her many knitting projects. We became intrigued with Alpacas several years ago and had a dream of one day having Alpacas. 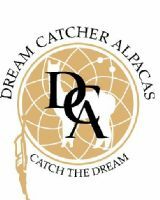 In 2005 we finally caught the dream and started our small herd of quality Alpacas at Dream Catcher Alpaca Farm. Born, Bred & Produced in the USA! Come with us & Catch the Dream! Our vision then and now is to produce the highest quality Alpaca fiber. We continue to hand spin the fiber from roving and we offer roving, handspun and processed yarn. We have expanded into weaving and will have finished items to offer as well. We invite you to come to our farm and experience the joy and satisfaction of being around these wonderful animals.